Château Portal is one of the leading estates in the Minervois with a history dating back to the 11th century. The property was home to French nobility throughout the Middle Ages and to this day retains a restored 8th century chapel. Jérôme Portal’s 80 hectares of vines grow right next to the region’s top cru, La Livinière.Cuvée Jérôme is crafted mainly from rich and spicy Syrah supported by raspberry rich Grenache and spicy Carignan, the incredibly intense flavours of which are due to rare 100 year old vines. The wine is aged for a year in French oak barrels, lightly toasted over a naked flame to impart mocha character and extra complexity.Serve this splendid southern French red with traditional cassoulet or roast shoulder of lamb. The third issue of Hot Rum Cow, the magazine for the curious drinker, is in the shops now. 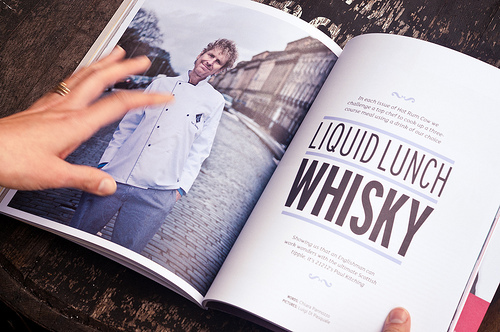 White Light Media presents a magazine to put fire in the belly – Hot Rum Cow, the whisky issue. For our third adventure in the world of drinking we’ve been trotting the whisky globe digging up whisky’s murky and subversive past, and peering into its future with some of the most exciting producers working today. We’re mixing it, we’re matching it, we’re teaching you how to drink it and curing the after-effects. But, we’ve not just got spirit. Over 100 gloriously designed and illustrated pages we bring you flaming cocktails, picnic wine, barrel-aged beer, poetry from Liz Lochhead and an interview with Hollywood actor Brian Cox. Hot Rum Cow is the first news-stand title by Edinburgh-based White Light Media and is helping to lead a worldwide renaissance in lovingly crafted, independent magazines. The first two issues have received plaudits from influential industry figures and enthusiastic readers all over the world. The print product is supported by an intelligent but simple digital marketing campaign, which has built up a lively online community. Issue 3 is available to buy now in selected magazine and high-end drinks outlets or direct from www.hotrumcow.co.uk/shop. An iPad edition is also available from the App Store.